Shooting film is like sending a message to yourself in the future. Sometimes you don't even know what the message was until you receive it later. For example one winter day back in 2003 I was wandering around Portland taking photos and this message wound up on the roll. I don't remember taking the photo. It's possible it was just an accidental shot between frames, or maybe I was actually focusing on something in the scene which I've long forgotten. From the background I know I was on the corner of SW Park and Market. The Number 6 bus doesn't normally go by that intersection. 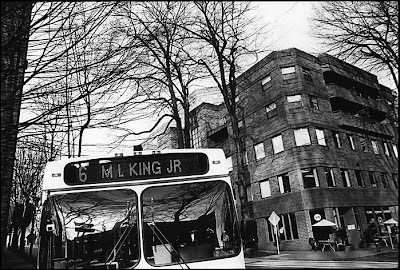 It stays mainly on ML King Jr. Blvd on the other side of the river before making a brief swing through downtown a few blocks north of Market. But on that day for some reason there it was and I shot it. It's an unremarkable photo in most ways. It wouldn't even be worth mentioning if it weren't for the fact, which I realized the next day developing the film, that it was Martin Luther King Day when I shot it. Message from the past received, loud and clear. Perhaps it is a message from your subconscious mind?